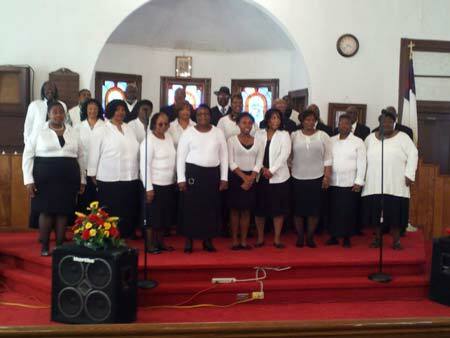 Saturday afternoon, the week Edgefield was rocked by an earthquake, the Edgefield Mass Choir rocked the Macedonia Church celebrating Black History Month and the First Anniversary of the Choir with an extraordinary engrossing gospel concert. Reverend Johnny Clark who is the pastor of the Macedonia Baptist Church opened up the program with prayer. Former Johnston Mayor Willie Campbell and State Representative of District 82, William Clyburn, were present as the guest speakers. Clyburn spoke in a somber tone that he knew would be uplifted by the choir so he took the opportunity to speak frankly. Besides stressing the importance of the history black churches have played in this country and in our area, he continued with an inspiring message directed to all individuals, not to sit back and just let the world go on … but to step up and get involved. Look to building more small businesses in the community that can then offer more jobs and put more people to work. He also spoke of how important it is to document a family’s life for the children and grandchildren so the children can learn of what their parents did to bring them to the place where they are now; for, “If the family doesn’t, someone else may do it for you and you may not like what they have to say,” was his admonition. After he closed, the concert began with an outstanding performance by a group from Ridge Spring, the Hopkins Brothers. And then the voices of the Mass Choir exploded into the room with soulful, powerful voices that raised the audience out of their seats with their extraordinary performance. Joshua Hillary belted out “Let It Rain” with Jennifer Smith who also sang “Call Him by His Name,” Joanne D’Antitnac led the Choir with “I Really Love the Lord,” George Williams, Jr., (Little George) sang “Get Ready for your Blessing” and Shirley Thompson led “God is my everything.” The choir ranges from 45 to 85 voices depending on the time of year and schedules. All of these dedicated members are from Edgefield County and anyone from the area is invited to join. After the concert a group went to dinner at the L & H Bar and Grill across from Slade Lake where they discovered the owner, Lei Sean Frazier, is a member of the choir. A graduate of culinary school in Detroit Michigan, she and her husband Harold moved to Edgefield recently and opened the restaurant here in Edgefield where she takes pride in cooking everything from scratch. Lei Sean said she’s been with the Choir almost since their beginning and that the camaraderie of the group is like a church in itself. Mr. James Bibbs (who is not a singer) is the founder of the Choir. When he retired from the military, he felt that the community was divided. He believed the best way to bring the community together was to sing God’s word. A community that prays together stays together. Look for more information on upcoming events in The Edgefield Advertiser. To get involved with the choir or donate to their group call 803 321 0377 — all are welcome.